Paris, Day 2, was even better than the first, combining typical tourist attractions with some special sights. After passing countless closed cafés on our apparently early, 9 a.m. start, we came across Le Parvis. Though it was just one of the many eateries on the Rue d’Arcole, it was the only one we found to be open. Thankful that the restaurant was even going to serve us, we did not expect much from the meal, only craving morning nutrition. Our breakfast, however, was delicious. With outstanding omelettes, crispy croissants, and fresh juice, it was one of the best meals of the week. Fueled with fantastic French food, we began our second day of exploration. Of the many things I learned in my first years of French instruction, I have inexplicably distinct memories of discussing one of Paris’s grand shopping centers. Based on my faint ideas and images of a beautiful building housing posh, Parisian products, my family and I set out to investigate my hazy remembrances. Combine the luxury of Saks Fifth Avenue with the mesmerizing appeal of stained glass to get the stunning Galeries Lafayette. Cosmetics counters below and a glass dome above, the 9-story shopper’s paradise is worth a visit, if not for its fancy products or indoor aesthetic, then for its free, rooftop views. With only a few sets of chairs but ample AstroTurf on which to sit, the terrace of the Galeries Lafayette was littered with lunchtime visitors soaking up the springtime sun and taking in the sights of the Eiffel Tower. For my family and I, it served as the setting for our Parisian Macaron Matchup. Macarons, often mistakenly identified as macaroons, have become associated with the French almost as strongly as the croissant has. When I researched the best macaron shop in Paris, however, I found conflicting opinions. Fellow travelers narrowed the options down to two pastry houses: Pierre Hermé and Ladurée. With a Pierre Hermé kiosk in the Galeries Lafayette, my mom, aunts, and I thought it a perfect time to try one of the best. We ordered a cup of six, funky-flavored macarons to split, taste, and analyze. The first flavor we tried, Imagine, of Matcha green tea and black sesame crisp, was all wrong. Next was Infiniment Rose, which was much better, a very mild-tasting and pleasant treat. Third, we tried Mogador, a milk chocolate and passion fruit macaron. The tart wafers and rich center clashed, so we gave this one a thumbs down. Fortunately, the citrus wafers and creamy center of Velouté Infiniment Orange tasted like harmonious creamsicle. Following the orange macaron, we sampled Céleste, a passion fruit, rhubarb, and strawberry concoction, which wasn’t great. We finished with Infiniment Menthe Fraîche, or mint, which was underwhelming too. Overall, the sweets were made well, with soft-flavored wafers and tongue-shocking centers, but the flavors weren’t practical or enjoyable. After our snack, we set out to see the west side of the city. On our way through the Place de la Concorde, we came across a Ferris wheel, which was erected to promote the 2016 UEFA European Championship, to be held in France this year. A ride to the top offered sky-high views of the Avenue des Champs-Élysées and the Arc de Triomphe, our next destinations. Walking down the Champs-Élysées, I was surprised at the luxury, scale, and commercial presence on the street. From what I had interpreted from my classes, this was a street of quaint, albeit inauthentic, cafés and small, overpriced boutiques, not stories-high chain shops. Nonetheless, the tree-lined route made for a pleasant journey to view the towering Arc de Triomphe. Skipping the tourist cafés of the Champs-Élysées, my family and I searched for a snack around the Louvre Museum, the next stop on our Paris agenda. Settling on La Comédie, I enjoyed my croque madame outdoors, people watching, like a true Parisian. The grounds of the Louvre were dotted with visitors playing photography games, “pricking” their fingers on the top of the iconic pyramids. This is where my family and I waited for our museum tour guide, Georgi, who my aunt discovered via Airbnb. A friendly and knowledgable host, Georgi led us to the highlights of the Louvre, because the museum is impossibly large to tackle without a plan. We saw the Venus de Milo, the Winged Victory of Samothrace (my favorite), and of course, the Mona Lisa. Georgi shared some of his art history expertise with us, explaining the story of the painting of the Mona Lisa. Many years ago, an Italian man stole the Mona Lisa from the Louvre, creating a hype around the missing painting. According to the story, once he was caught, investigators asked why he chose the Mona Lisa, and he replied that the work of Leonardo da Vinci deserved to be displayed in Italy, and because of its small size, the Mona Lisa was the easiest to steal. With the excitement of the theft, visitors rushed to see the Mona Lisa upon its return to the Louvre. The woman’s “mysterious smile” is a popular attribution to its acclaim, but Georgi pointed out that many of the other women in da Vinci’s numerous works portray a similar smirk. He continued to explain that the Mona Lisa is, essentially, the Kardashian of paintings: beautiful in its own right, but famous for nothing. Across the room from the little Mona Lisa hangs The Wedding at Cana, a grand painting by Paolo Veronese. Georgi noted that the dimensions of this painting, about 22-by-32 feet, is generally the size of an average Parisian flat! On our way out of the museum, we passed by another fun-fact art feature, the “selfie statue.” Apollo Slaying the Python, the title of the work, clearly explains the act of the Greek god snapping a photo of himself to post on Instagram, #Louvre. To end our spectacular second day in Paris, we made our way to the Trocadéro Gardens to see the Eiffel Tower illuminated in the Parisian night sky. Though I was unable to enjoy the park itself, it provided a fantastic and full view of the Eiffel Tower. Many others knew of the spot, with a street performer and local food trucks complementing the tourist crowds. Fortunately, we arrived just in time to catch the sparkling lights of the grand tower. Though there were hordes of people vying for the best angle of the monument, the location offered everyone an exceptional look at the eminent Eiffel Tower. The Royal Palace of Madrid from its left-wing courtyard. Like the Flamenco show and the bullfight, I saved seeing the inside of the Royal Palace of Madrid, another what-to-do-when-you’re-in-Madrid staple, for my family’s visit. The Plaza de la Armería splits the Palacio Real de Madrid and the beautiful Cathedral de la Almudena. Together, they convey a sense of grandeur and aristocracy from days past. From the outside, the Royal Palace simply looks like a large government building. The inside, however, is much more ornate. Once within palace walls, you are not allowed to take photos past the reception area. Throughout the hallways of this royal abode, though, are some of the most elaborate rooms I have ever seen. With an audio guide as our navigator, my family and I walked room to room, learning about the monarchs of Spain and their lavish possessions. 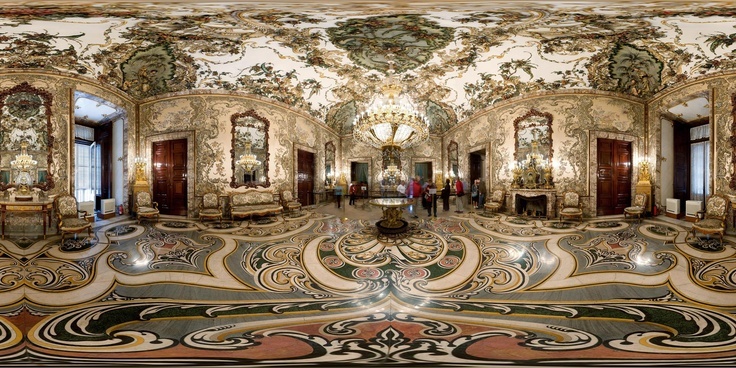 My favorite room was the Gasparini room of Charles III, decorated floor-to-ceiling with incredible print and color. The armory was another memorable area of the royal complex, displaying an impressive collection of imperial armor, and accompanying views of Madrid and the mountains beyond. After having been indoors for most of the morning, we spent the second half of the day in Madrid’s Royal Botanical Garden, or Real Jardín Botánico. With grounds much larger than they appear, one could spend an entire day strolling through the rows of vegetation. Though the flowers are the most photogenic, the gardens were also filled with fruit trees, aquatic foliage, and succulents. There was even a greenhouse, sheltering tropical plants from around the world. We may have been too early in the season for the gardens to be in full flourish, but the spring air and sunshine still made it a great day. Fun, flower photo editing— it’s amazing what a computer can do! Tonight’s nighttime activity was a jazz club. Or supposed to be a jazz club. Unfortunately, Café Central, the restaurant and live entertainment hub, was packed by the time we arrived, requiring reservations or early attendance. The full house looked like a good sign of a good time. Next trip, we’ll call ahead. Though we would have enjoyed a night out, my family and I welcomed an early early end to our day and a good night’s sleep. Tomorrow morning we would be traveling to Paris! From a short-notice additional week off, and a last minute change of plans, I found myself standing at the large, frosted glass doors of the airport’s arrivals. I watched others receive their loved ones and smiled at their reunions, but I leaned against the railing impatiently, waiting to surprise my own visitors. Almost an hour after expected, it was finally my turn to overwhelm my weary travelers with hugs and happiness— my mom and aunt had arrived! After spending three months with strangers (many whom I’ve come to adore), I was at once comforted with familiarity and love that only a family can provide. I could not wait to begin this week in Europe that my mother, my two aunts, and I would always treasure. Excited but exhausted, we agreed to rest the first day of their visit. Fortunately, this in itself was a pleasant experience at the Airbnb we stayed in for the week. The apartment was centrally located, clean, spacious, and safe. Aside from the poignant, grape-scented diffuser that made the room smell “purple,” we had no complaints. Madrid greeted my family with a rainy day unlike any that I had experienced here before. It poured. I had to adjust my plans to show them the city. My aunt suggested that we take a Madrid City Tour bus to shield ourselves from the weather while still touring town. The poor-quality headphones made the audio guide difficult to understand, but I did my best to make up for the guide by informing my family with the facts that I knew. Between the two bus tour routes offered by Madrid City Tour, we were able to see the city’s highlights, and even visited areas of Madrid where I had never been before. After drying off and regrouping at our Airbnb, we took a short walk to Cardamomo for a traditional Flamenco show. The only flamenco tablao in Madrid to have been reviewed by the New York Times, we decided that proximity and quality made Cardamomo a great choice. With tickets for the 8 p.m. show, the four of us squeezed into a tight row for four, ordered included drinks, and prepared for the performance. Two guitarists and two vocalists, all male, took to the perimeter of the stage. The musicians seemed to pluck at the guitar strings as they wished, producing coherent but disorderly staccato tunes. I could also appreciate the talent of the singers, who had to almost yell for their raspy voices to be heard above the guitars. Though at times their vocals resembled those of Middle Eastern songs, I could feel antique, Spanish authenticity in their voices. Soon after the musical opening, a first dancer appeared on stage. His body was slim and his movements were graceful. Relieving the first man, a second dancer took the floor. With a muscular build and a long, curly, black ponytail, this dancer better fit the my idea of a fiery Flamenco dancer. You could tell, though, that he was a younger dancer, less mature than the first man. Finally, a woman performed, mesmerizing the crowd with powerful steps and spins in her traditional, Flamenco dress and scarves. Without any knowledge of the various forms of Flamenco, I did not know what to expect from this show. The dancers did not use props like flowers, fans, or castanets, as I had anticipated. For this performance, it seemed as though the musicians had a better chemistry with the male dancers than they did with the female dancer. It was more entertaining to watch the men on stage because of the strength in the connection between the performers. Where there should have been a passionate admiration and appreciation for the woman, I did not feel these emotions conveyed by the men during the show. Despite not knowing much about Flamenco, the show was the perfect evening activity for my aunts, mom, and me. Clear, blue skies and sunshine determined our day’s agenda. We strolled around Retiro Park, one of my favorite places in Madrid, where I showed my family park highlights, such as the peacocks in Jardines de Cecilio Rodríguez, the Crystal Palace, which was in between exhibits, and the boat pond. Where last night’s Flamenco show was light entertainment, tonight’s event would be less pleasant. Interested in seeing, but not in support of, traditional Spanish bullfighting, my family and I went to watch this cultural event that has such a strong presence in Spanish history.